Sophie remains on the surface as such it is just myself and Keira who are heading up the Third Path currently. Despite this things are moving along surprisingly smoothly. We’ve been working with the other explorers who returned to the cavern to remove the various barriers and blockades the DRC left behind as well as securing other areas of the city and its Ages and gathering documentation for archiving. I have been studying the documents James left behind. He had done extensive research on the Bahro and their enslavement. There was some curious notes pertaining to “seers” and a tablet but I couldn’t find any more information on this. He had also sketched out a strange symbol several times, I’m sure I’ve seen this symbol somewhere before but I can’t recall where. I’d love to write his research off as crazy, but a lot of it matches up with my own research into the Bahro. Aside from his research into the Bahro it appears he was researching The Art, there are extensive notes regarding Garohevtee and the processed behind Age Writing, indeed it seems he was reaching a point where he was about to attempt Writing his own Age. We have said from the get go that The Third Path would not indulge in Age Writing, I don’t believe humans are ready for it. We ventured up into the higher areas of Ae’gura today, there is a lot of damage up there. We’ve been keeping an eye out for any Books or ink but between the DRC, Gehn, and Atrus most areas have been cleaned out. Headed back to the Tehren this morning, I found my mood unsettled on the surface, just sat there doing nothing, mourning David. I feel bad for moving on so soon, but I know continuing with our work is what Dave would want. I Linked in to find another presence in the hood, impossible as it seems (we went to great lengths to shut this hood off from outside visitors) but we appeared to have an intruder. 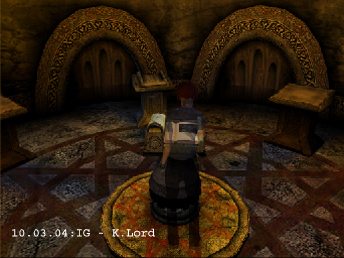 I followed the intruder to the book room and managed to snap a KI image of them before they vanished through the Nexus book. It looked a bit like Sophie, but last I heard she was still on the surface. It’s been a tough few days, we held a memorial today for David on his Relto, the Book of which has been placed in Tehren. Sophie is heading to the surface to notify the family and to take some time out, she and David were very close, this has hit her hard, indeed it has hit all of us hard. Once I have finished securing everything, I shall be heading to the surface myself, Keira too is planning some time away. As for James I don’t know what to make of it. I know he could be confrontational at times, if not short tempered, but I wouldn’t expect him to do anything like what seems to have happened, this ill feeling was only re-enforced when I was in the City Proper earlier. I had gone back to his place to look over the area and gather up the remaining documents when James himself appeared, I had barely glimpsed him before he saw me and Linked out. If he did nothing wrong, why did he not stay and tell us what happened? Why run? It seems I am slowly being forced to consider that perhaps James is guilty for the death of David. The worst has been confirmed, Keira headed up to the City Proper to find James, who also hasn’t been seen since David’s disappearance, figuring that David had gone to get James to return to his projects, there she found David’s body. Keira thinks that David and James got into it, resulting in Davids death, from the look of the scene it seems to indicate as much, but I’m not an expert in these matters. David’s body is at a weird arch from where the balcony above is, indicating some speed or force in his fall which doesn’t appear natural. We had made our way up to the area James had been apparently living in. The balcony rail had been broken, we found fragments under David’s body. James’ area was full of notes on the Bahro, D’ni Slavery and on The Art. We’ve confiscated his journal and notes to study and see if we can find out what he was planning.